Journalism is a dangerous business. In 2016 seventy-four journalists gave their lives while trying to gather news for you. 19 of them were killed while covering the war in Syria. People do a lot of complaining about the media, few recognize it as a dangerous job. An NBC reporter, Katy Tur, was covering a Donald Trump rally last year when the crowd turned on her. Secret Service Agents assigned to Trump had to protect her from them. The first amendment guarantees a free press, but it doesn’t guarantee their lives. The first amendment guarantees five areas of free expression. Whenever you see me referring to the First Amendment, I’m referring to all five of them. In past weeks I have written a great deal about the U.S. constitution in general and the first amendment in particular. Few really recognize their importance because not many of us have ever lived in an environment where the freedoms we take for granted are denied. All it takes for us to descend into totalitarianism is to lose the guarantees of the first amendment. If that should happen. All the rest of the constitution might crumble as well. Our constitution is unique, it is a document in which the founding fathers made a critical decision. They felt that we the citizens had certain inalienable rights (declaration of independence) that did not need to be written down. They felt that if rights were written into the constitution then they could just as easily be unwritten. So they wrote a document that protects our rights by telling the government not the citizenry what it can and can’t do. The first amendment, for example, does not guarantee the right to free expression. It assumes we have that. It tells the government that they cannot abridge that freedom. In effect, the first amendment is protection from government interference with “God-given freedoms.” The great majority of other countries in the world have few protections. In preparing this blog I did some research on just a few countries to use as examples. I think you will find them terrifying. 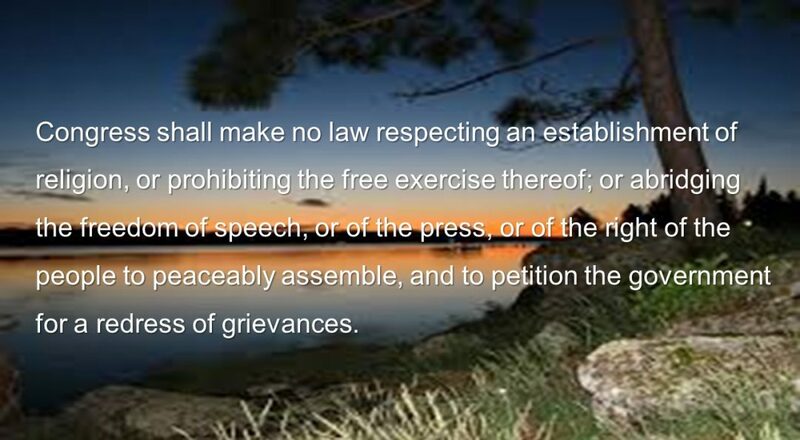 I hope you gather from this blog that even if you have an intense dislike for our mass media it is to your advantage to support them and to advocate for the first amendment. The alternatives are too awful to consider. In order that you can better appreciate what we have, let’s look at life in some of them (the following information was gathered from several sources including the CIA Factbook, the BBC, The Committee to Protect Journalists, Radio Free Asia, and other sources as noted). Please read, share and comment. Saudi Arabia; their government is based on Sharia (Islamic law). Their citizens have almost no freedoms, especially of religion. Most of their population is Muslim with the exception of foreign workers. If you get caught practicing a religion publically or talking about a religion other than Islam, you may get imprisoned. Non-Muslims are allowed to practice their own religion at home and it is prohibited to bury them on their soil. Also, in Saudi Arabia women have a limited amount of rights. It is illegal for them to drive and most women wear black cloaks to avoid being stopped by the religious police. Saudi Arabia also limits the freedom of speech and press. They censor over 400,000 Internet sites to block anything that might be considered to be offensive to Muslims. Myanmar (Burma). While the military junta is showing signs of easing restrictions, human rights are still very limited. The government owns all the daily newspapers, three television channels, and most of the radio stations. Some citizens have been arrested for secretly watching BBC World News and listening to Radio Free Asia. The authorities in Myanmar has gone so far as to require all cyber cafes to install cameras to monitor users. Citizens, there are pretty much blind to what’s going on around them. They only know what their leaders tell them. It is very difficult to get a groundswell anti-government movement going when all available information about the government is positive. North Korea. This is the most censored country in the world. The Committee to Protect Journalists (CPJ) has found it has the deepest information void. There are no independent journalists, and all radio and television receivers sold in the country (and you are not allowed to order one from elsewhere) are locked onto government channels and stations. Annual GDP per capita is about $1,800, which ranks 197th in the world, according to the CIA World Factbook. GDP is 28 times higher in the United States and 18 times higher in South Korea. One-third of children are stunted, due to malnutrition. The average life expectancy, 69, has fallen by five years since the early 1980s. Those are the facts, but if you lived in North Korea you would hear a different story. The state-owned news media would have you believe that the country has never suffered famine or poverty. That’s a big enough lie, but worse yet is this one. The Government repeatedly tells stories of how citizens so love their leader they would allow members of their own family to die in order to save a picture of “Dear Leader.” After a North Korean munitions train exploded, the state-run news agency reported that people ran into buildings to save the ubiquitous portraits of the “Dear Leader” before they rescued their own family members. TURKMENISTAN a country most people have never heard of is among the harshest in the world. Their leader Saparmurat Atayevich Niyazov took office in 1991 and declared himself President for Life. The state owns all domestic media and Niyazov’s administration controls them by appointing editors and censoring content. Niyazov personally approves the front-page content of the major dailies, which always include a prominent picture of him. In 2005, the state closed all libraries except for one that houses the president’s books and banned the importation of foreign publications. The state media ignores issues like rampant prostitution, unemployment, poverty, crime, and drugs. And b think that’s bad? Try this on for size, State television displays a constant profile of President Niyazov at the bottom of the screen and newscaster are required to begin each broadcast with a pledge that their tongues will shrivel if their reports ever slander the country, the flag, or the president. And one more, BELARUS. According to CPJ The President, Aleksandr Lukashenko, has consolidated the most influential media (print and broadcast) under a government program that requires that he be constantly praised by journalists. The state has shuttered dozens of independent newspapers. Lukashenko’s administration has ordered that state printing houses not print critical newspapers, barred the post office and the state newspaper distributor from distributing independent publications, seized entire press runs of independent newspapers, and set prison penalties of up to five years for criticizing the president. More than two dozen domestic and foreign journalists have been jailed for “hooliganism” while covering stories. Political attacks on the American news media have sought to discredit them. Many politicians would prefer you heard your “Truths” from them. If these discrediting efforts are successful, then the discreditors become the only source of news and information. If and when that happens all of our other freedoms are threatened. The next step is state run news. I don’t think any of us wants that. Posted in U.S. Constitution.Tagged Belarus, Burma, cia, first amendment, Journalism, Myanmar, North Korea, peace, Saudi Arabia, Turkmenistan. Great piece, Bob.. I have shared it on my page with a few comments… I hate to see our President disparaging the press constantly, calling them so dishonest… I know the press does not always go after the hard facts and push back as often as I want them to, but they do an extremely valuable service for us, and it’s one we should never take for granted! Thanks again…! This is all true Bob. I would not like our Country go the way of these countries and I for one am willing to do ANYTHING to prevent it. But you listen to CNN and they are so far to the left on political issues they are nearly out of sight. then you listen to FOX and they are such as far to the right ans CNN is to the left. So who do you believe? I don’t believe either of them. I spent an evening listening to MSNBC (I think I have that right) and it sounded as if their facts were just a little bit distorted to. Newspapers are the same way; some like New York Tribune is very close to the likes of Enquirer. So when you are looking for some truth in the matter who do you personally rely on? Why do those Leftist idiots (pardon the redundancy) want to deny the right of free speech to people who disagree with them on things? Next Post The Trump Administration and the Russians. What’s Going On?